Captain Thompson: Do you usually let your men slouch about in that fashion? Captain Thompson: I'm not interested in what you've finished. I was ten-years-old, growing up during the war in England, when this, and other raids were being made against the Nazis. In 1955, I had completed a three-year enlistment with the U.S. Marines, and therefore extremely interested in commando-style warfare. 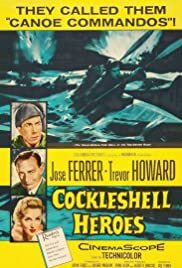 "Cockleshell Heroes" was entertaining, even though Columbia Pictures capitalized on a suicide mission and glorified it, thus overlooking the rugged training, and horrible cost in lives. Nonetheless, glory aside, the film triumphantly displays loyalty, dedication, that is the trademark of the Royal Marines. But after reading the first person account of the raid, you don't really appreciate what these heroic men did until you read the book. The first misconception given in the film is that this was a commando unit, when in fact, the dozen selected, were regular Marines who volunteered. The hardships endured don't come across as hard in the movie as they do in the book. The loss of food, inability to move for hours at a stretch, not able to relieve themselves, are just a few of the oversights that would have shown the ruggedness of the mission. However, even with some sour notes, I still like the film for showing the Marines as one of the best fighting forces in the world.